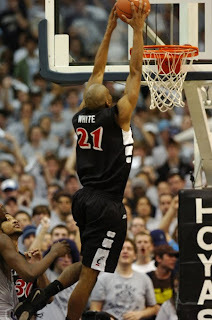 In the previous post, I started a countdown of the top UC basketball players of the decade. It continues today with players 9-7. It bums me out a whole lot looking back through stats and pictures of the way things were in the mid-00s and the 90s. This program didn't have to fall like it did. But, the sweet wouldn't be as sweet without the sour as they say in Vanilla Sky, so taking our lumps now will only set us up for the reward of being back to national relevance and in the NCAA tournament. I think Mick Cronin is the man who will lead us to the mountain top, or at least to the mountain. With all the bummer stuff out of the way, let's relive some of the good days shall we? In case you missed the last post, the countdown begins here. 8. Pete Mickeal. I loved me some Pete Mickeal. Kenyon Martin's wingman was not too shabby himself. He was another 2 year player, and was very solid. He averaged 13.5 6.3 1.8 and 1.4 steals this decade. His junior year was better stat wise, but Pete was a hard worker. He was an honorable mention All American his senior year. Pete was also left handed, so when I would ball it up in high school, any lefty was called Pete Mickeal. Especially if he played hard defense. I don't have any Pete Mickeal video game stories, so let's move on to the next man. 7. Leonard Stokes. 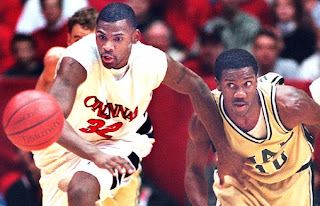 Lenny Stokes was one of the more frustrating Bearcats that I remember. I always thought he had so much potential, and he would flash it, and then put it away. Lenny averaged 10 his career, but taking out a freshman year he didn't play much, he put up 10, 12 and 15. I think the biggest thing I didn't like about Stokes was that he was a terrible 3 point shooter, who thought he could shoot the 3. Just 29% for his career. Leonard was the typical Huggins player though. He stayed all 4 years and learned, and grew and by the time he was a senior, he was a team leader. The 2002-2003 team wasn't the best, but Lenny tried his best to make them something. The absolute best Stokes game was in 2001 against UCLA in the second round. Stokes put up 39 points and 10 rebounds in 46 minutes. He was the best Cat on the court, and that team had Steve Logan. That was one of the worst losses I can remember, but I was incredibly proud of how the team played, and a big part of that was 13.